Problem: Create a series paired interaction color studies. Try to make 1 color appear as 2 different colors by altering its surrounding/background color. Limits: Using gouache and/or digital techniques, create Josef Albers-style pairs. These consist of large squares 2″x2″ of a varying hues and small 1/2″x1/2″ center squares of one chosen hue. The small squares will sit in the middle of the large squares and should be the same for each pair. 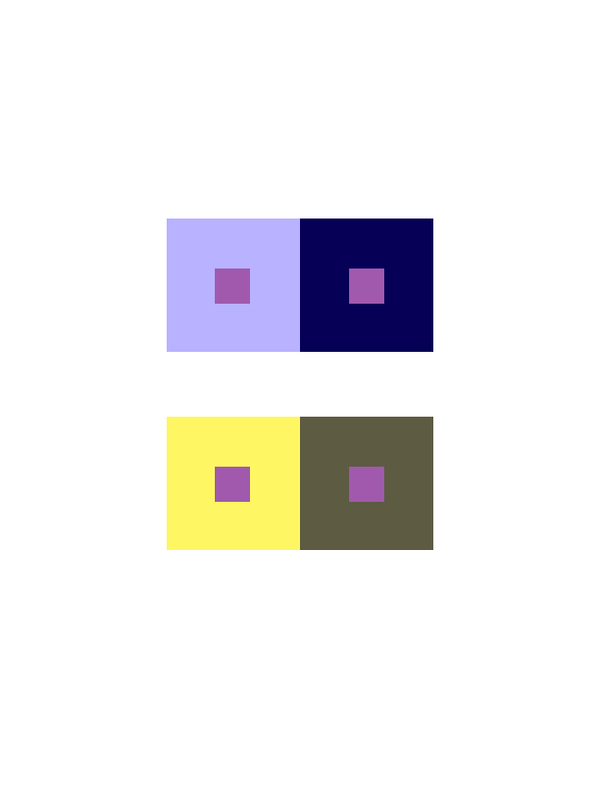 Concepts: Simultaneous Contrast, After Images, Optical Mixing, Complementary Colors, Temperature. If you have an iPad download Josef Albers Interaction of Color App! For specific instructions and references refer to the class outlines and notes from classes 24-25. Create a total of 8 pairs of color interaction studies– making 1 color appear as 2 different colors by changing its surrounding color. Each PAIR consists of 2 interactions for a total of 4 interactions per page. The small square should be the same for each pair. Group 1: 2 pairs of achromatic gray studies will explore interactions by shifting value. Group 3: 2 pairs of color studies will explore interactions by shifting hue, but not value. Group 4: 2 pairs of color studies will explore interactions by shifting hue and value. Your final Color Interaction Studies should be ACCURATELY PRINTED. If you do not have a GOOD color printer at home, you will need to take your files to a copy shop, like Kinkos on Court St. or SaveMor on Flatbush Ave. Do NOT “scale to fit” when printing. Even if your digital files are accurate, if your printouts do not demonstrate the color interactions intended, you will not receive credit for the phase. Find a partner and think of a color that defines their identity (the type of person you perceive them to be). Do some research into the MEANING OF COLOR and choose a color that represents your partner’s personality. Ask your partner to do the same. Use paint, color wheel, or cut paper to visually demonstrate this color to your partner. Example Illustrator file. Use this file as a template for your final work. Fill one of the 6×6″ squares with the color that represents your partner’s personality and another that represents yours. Choose one additional color that contrasts both of your color choices. This is your shared (influenced) color. Fill two smaller squares (approx. 3×3″) with your shared color. You may need to choose a less-saturated hue or variation in value in order to create good contrast. Spend a few minutes experimenting with these color interactions until you can get a combination that recreates the type of interactions we’ve been exploring. ie: the shared color should look different when surrounded by the personal colors. 3) and one will be a shared influenced hue. 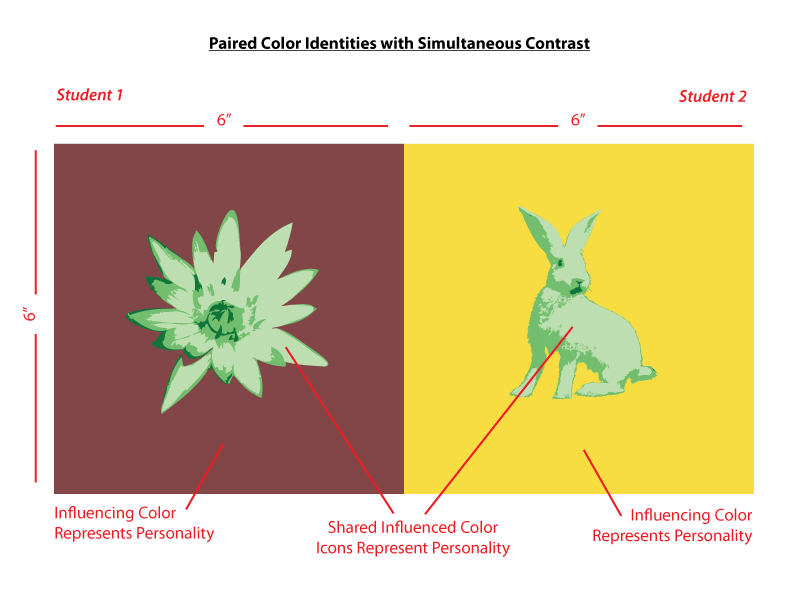 Like the Paired Interactions Studies we just completed, keep your shared hue exactly the same. Experiment until you achieve Simultaneous Contrast. Research the meaning of different types of icons and images. Find some that represent your partner’s personality. What is a silhouette? Portraits from black card became popular in the mid-18th century. They are used in many mediums to give immediate identification or meaning. Take a look at the artwork of Kara Walker to see how she uses this method to convey meaning in her work. Also look at Indonesian Wayang Kulite – Shadow puppetry. Research all the different ways silhouette is used in graphic design, theater and art. Define a personal icon or symbol that represents your partner’s personality and make at least 10 sketches. Once you have decided on your colors and icons, create a final sketch of each icon (using photograph references). Create at least 10 different thumbnails of the icon that will represent your partner’s personality. Choose the best and create finalized line drawings. Scan and trace the sketches in illustrator. Fill the icons with the shared color. Thoughtfully place the icons within the background/influencing color. The composition should illustrate your partner’s personality using the chosen hue (ground) and the shared contrasting hue (figure/icon). Make sure the icon or symbol is sized and placed appropriately in order to demonstrate a stable figure-ground relationship. Make this choice with your partner, so that your individual compositions work together. The icon (influenced color) must be surrounded by the background (influencing color) in order for Simultaneous Contrast to be observable. Save your Illustrator file for reference and a export a 72 dpi jpg or png file for upload to the class blog. Refine your work and make sure you are communicating with your partner. You may work independently on your digital files, but the FINAL compositions should be printed on card stock (or mounted on bristol) and displayed together as one composition. NOTE: The print should from the same printer. Make several test prints to make sure what you see on the screen is the same as in print. The interactions must be visible in print! As with previous projects, research, thumbnails, evidence of multiple drafts, consideration of overall compositional balance between figure and ground, unity, and communication of a clear concept or theme is important!